If you are behind in your mortgage payments, you may be contacted by individuals or companies that will offer to help you work out a loan modification with your lender or provide other services to you in order to help you prevent a foreclosure of your home. These same companies will fraudulently claim to have a team of attorneys working for them, when in fact they do not. California law prohibits attorneys from directly calling potential clients or working with non-attorneys. 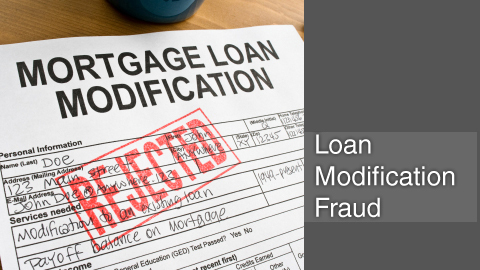 You must be very careful when asked by these loan modification companies to pay for any of their services in advance, whether in cash, check or by charging your credit card. California law forbids companies and attorneys from collecting any advance fees for such services if a Notice of Default has been recorded against your property. If you have already paid thousands of dollars in fees to a loan modification company or an attorney, it is very likely that you have a right to recover the fees you paid plus damages. Even if a loan modification was obtained for you, we can represent you to recover your money plus any possible damages. Lavaee Law Group has successfully litigated cases against both attorneys and loan modification companies.